COLUMBIA, Mo. – University of Missouri Chancellor R. Bowen Loftin and Commerce Bank Chair Jim Schatz today awarded one of the 2014 William T. Kemper Fellowships for Teaching Excellence to John Bennett, associate teaching professor of marketing in the MU Trulaske College of Business. Loftin, Schatz and a group of professors, administrators and staff surprised Bennett by honoring him with the fellowship, which includes a $10,000 check. 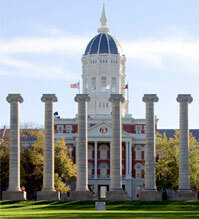 Kemper Fellowships are awarded each year to five outstanding teachers at the University of Missouri. John Bennett is an associate teaching professor of marketing in the MU Trulaske College of Business. Bennett, who has been a full-time member of the MU faculty since 2005, was named the MBA program’s Teacher of the Year in 2010. His students say he has an unparalleled love for teaching and brings extraordinary energy and enthusiasm to every class. Every class Bennett teaches quickly reaches full capacity. His classes are popular with marketing students as well as non-business students, such as those majoring in strategic communication in the MU School of Journalism. Bennett’s commitment to teaching excellence is evident in several other ways. Since 2006, he has taught in the college’s study-abroad program, first in Korea and then in Italy. Since 2006, he also has been chair of the “Making Me Marketable” professional-development conference, which more than 120 undergraduate and MBA students attend annually. In addition, he has presented at various academic conferences and published several papers on topics such as teaching technology and the use of the Web in enhancing classroom instruction. In recognition of Bennett’s accomplishments, he has received many awards from MU and elsewhere, including the Shelter Insurance Co. Teaching Excellence Award in Marketing in 2013 and the O’Brien Excellence in Teaching Award in 2012. In addition, Bennett was a Mizzou ’39 recipient in 2010 and received the University of Missouri’s Provost Outstanding Junior Faculty Teaching Award in 2009.